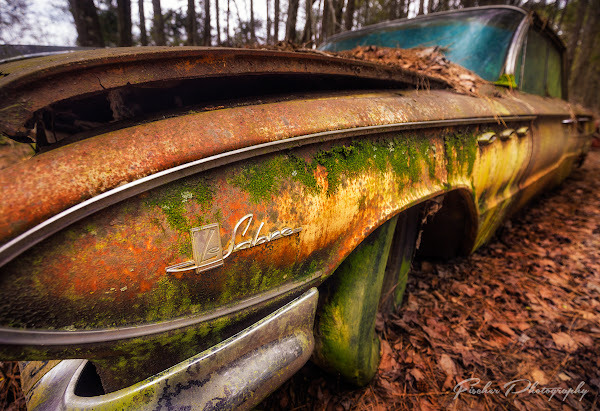 My desire to visit Old Car City started several years ago after first deciding to buy a subscription to the KelbyOne, or what ever it was called at the time prior to becoming KelbyOne. 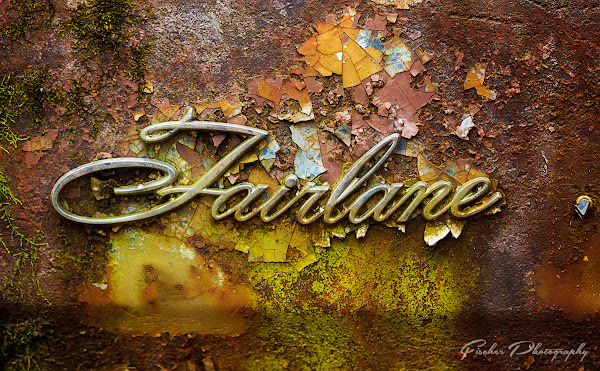 During my first hours of watching the long list of tutorials on subjects ranging from Landscape and Macro Photography to various Post Processing subjects I came upon a video titled Photographing Vintage Auto Americana by Bill Fortney. This video is still available on KelbyOne and have supplied the link below. The first thing you’ll come to understand about Old Car City is that it is not a collection of perfectly restored classics, or even ‘survivor’ cars that have not been restored but in outstanding original condition. No, Old Car City is filled with broken, busted, wrecked and otherwise well beyond their prime cars slowly being overtaken by the natural world from which their steel bodies were once a part of. Cars dating back to the 30’s and up through the 70’s and some even into the 80’s line some six miles of trails through acres of pine and hard woods. There are a few barns and sheds that cover a few of the ‘best’ cars, but by and large cars are lined up, and in some cases stacked, right out below the trees for pine needles and leaves to collect along hood lines and wheel wells. 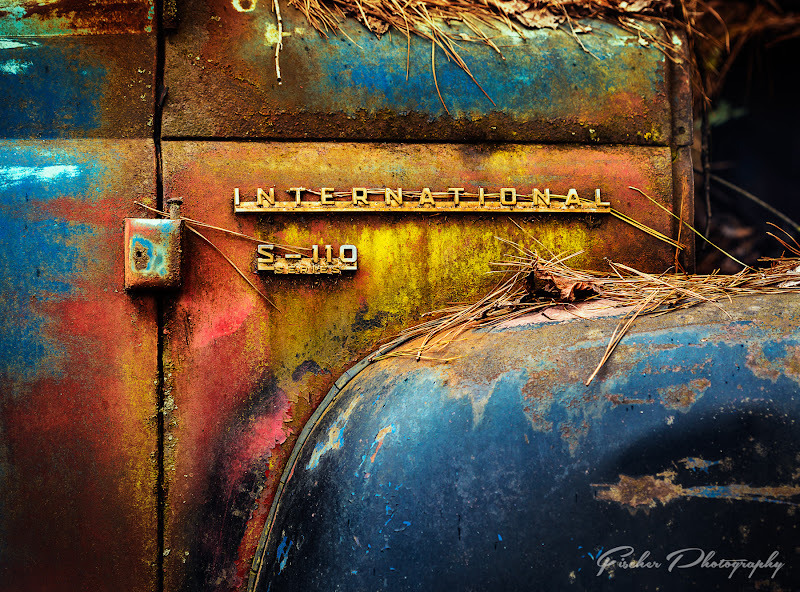 The result is a unique and truly artistic blend of natural soft elements, natural patina paint and rust and the classic lines of vintage american (and a few foreign) automobiles. Fast forward to the beginning of 2016, I started to look at where I had traveled over the last number of years, and where I wanted to start planning trips for the new year. What I quickly determined was that I needed to direct my gaze eastward far more often. Aside from a non-photography weekend excursion to New York City last June, I had not ventured east of the Mississippi much if at all over the last few years. Largely because the western half of the United States is where I have always spent most of my vacation time and was much more familiar with the National Parks and other photographic opportunities in that direction. So a new resolution was set, travel east in 2016. Wasting little time I recalled back to that video on KelbyOne and Old Car City. Located about an hour outside of Atlanta, or as I’ve heard it called more than once “Hotlanta”, I decided that if I was going to make a trip, it was going to be well before the late spring and summer temperatures started to climb. Looking at my schedule and that of my wife who works weekends quite often I selected a weekend she was already going to be on a business trip and started looking at flights on Southwest Airlines. Old Car City may cater to the automotive and photography minded individual, but obviously they’ve never heard of the terms ‘Golden Hour’ when it comes to light. Open from the hours of 9am to 4pm, even in the dead of winter the light isn’t going to be in that golden zone during any of their normal operating hours. While heavy use of HDR processing can tame the brights and darks resulting from the shadows cast by the tall trees between which the cars are arranged, I knew that my best chance for some great shots would be if it was overcast during my visit. As I drove north from Atlanta during my trip in late February, that was exactly what I had overhead. The heavy overcast would even out the light, soften out the shadows to nearly perfect smooth transitions, and allow me to pull out deeper more vibrant colors with less glare from the painted surfaces. After paying my entry fee, I was given a short primer on where the older and best cars were located given my fairly limited amount of time I had to wander the miles of trails. I quickly discovered that the owner was right, it would have been easy to spend multiple days exploring the rows of cars, far more than the half day I had allotted. Undeterred by by miscalculation in the scale of the place, I trekked onward to cover as much ground as I could. Tip: They have a map of where certain eras of cars are located. Take a picture of this with your phone, or see if they have copies available, take a few minutes and plan out your starting point. I spent far more time than I should have focused on the cars from the 70’s before finding the older and more visually interesting 50’s and 60’s era cars further back. Knowing that I was going to be walking at least a couple miles between these rows and rows of cars, I attempted to limit what I packed in my camera bag as much as possible. Knowing that I wanted the cars to be the focal point and for them to stand out against the background, I left my heavier landscape zoom lenses behind with the exception of the ultra-wide Canon EF 16-35mm f/4L, and added the 100mm f/2.8 Macro, 50mm f/1.4 to the bag. Adding my small 430 EXII Speedlight and off-camera triggers to the mix along with a small flash bender modifier for adding some fill light and directional light when desired. Having left my large Induro carbon tripod back home, it was down to the small MeFoto RoadTrip tripod to hold my camera steady when setting up macro and shots where hand-holding was impossible. With the smaller lighter lenses in the kit, it was well up to the task. Canon EF 100mm f/2.8 Macro – excellent for detail shots of badges, partial shots of the side fenders, the f/2.8 maximum aperture is great for reducing depth of field when zoomed in close, though it is often best to stop down closer to f/4 or f/4.5 to ensure enough of the car’s surface is in focus. Canon EF 50mm f/1.4 – Most often associated with portrait photography, the 50mm has produced a few of my favorite photos of nature and automobiles. 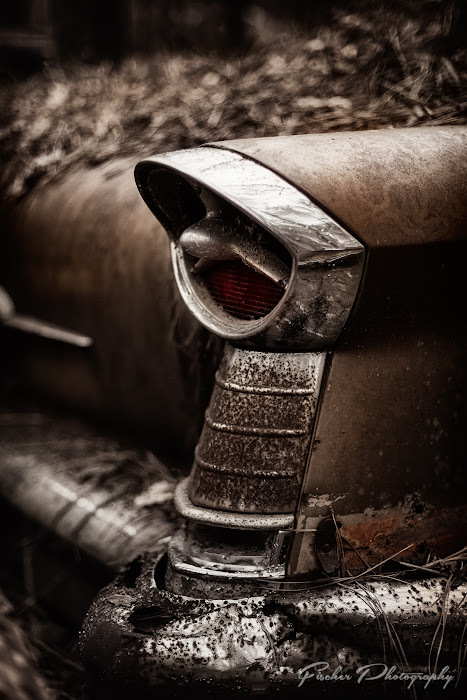 Its shallow depth of field is excellent for ‘Portraits of Nature’ styles of photography, as well as picking out hood emblems and parts of a car while letting the rest of the scene fall out of focus. Canon EF 16-35 f/4L – At the opposite end of the lens choices from the close up 100mm Macro, the wide end of the ultra-wide can create some very unique perspectives when the subject is bright right up close, exaggerating the effects of the wide field of view. So I guess the question is, did Old Car City live up to its preview in the KelbyOne video? YES. Would I recommend a photographer visit? If you have any interest in automotive photography, then yes. If you’re a nature photographer looking for a different take on the colors of nature, then yes. If you’re a portrait photographer wanting a really interesting backdrop for a shoot, certainly take a look. Old Car City does allow portrait photography, though they have some limitations on getting on the cars, opening doors, etc – so it might be best to get in touch with them directly. In fact, even if you’re not a photographer, but have any interest in cars, and you’re going to be in the Atlanta area, then its well worth a detour to spend at least a few hours, if not a couple days, exploring all the cars. If I’m ever up in that area again, and the weather is cooperating with overcast skies and good light even in the middle of the day – I would not hesitate to put it on the agenda again. As far as a take away from my first visit, its not to under-estimate the time you’ll want to explore. There are entire rows of cars I never saw, and others that I quickly had to scan through and pick a couple hand-held shots to get with little time to really refine my compositions or search for even better ones. I ended up splitting my day between this location and a Georgia State Park with a beautiful waterfall. While I do not regret my decision to make the second stop during my limited trip, it did greatly reduce the time I had to really work the cars further back into the property.